The 2011 Birthday Project Grand Total--$6,800! Congratulations! Isn’t that a wonderful achievement, particularly when times are so tough for so many of us? Your generosity demonstrates again what big hearts Zoners have, and how much you care for others. 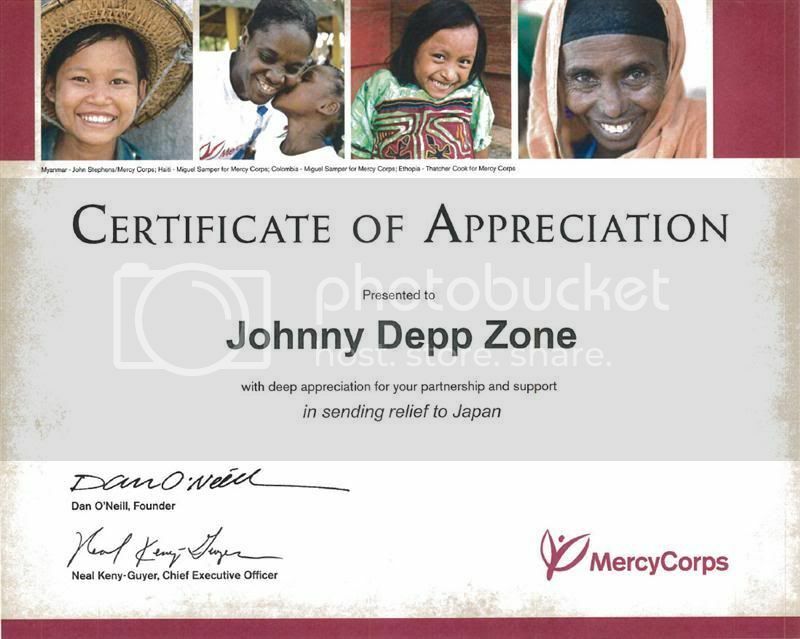 The final total of $6,800 includes $3,493 in donations to the Zone's Paypal account for the Birthday Project; $3,217 given directly to Mercy Corps via the Johnny Depp Zone donation page on their website; and $90 in checks written to Mercy Corps by Zoners. In keeping with our longstanding Zone tradition, I have donated an amount equal to the Paypal fees so that 100% of the amount Zoners donated via our Paypal account goes to Mercy Corps. Many thanks to Theresa for all her work setting up the fundraising page for this year’s project and keeping track of the donations. She did a fantastic job, as always! Once again, the Zone’s Birthday Project has been successful beyond our wildest dreams. I guess Johnny Depp brings out the best in all of us. Cheers to JD and to all of you, and thank you so much for helping our friends in Japan! Re: The 2011 Birthday Project Grand Total--$6,800! Congratulations! Many thanks PTP for that wonderful update and my thanks also to Theresa for such a fantastic job which enables us all to be part of this very rewarding charity - namely Johnny Depp! Thanks Theresa and Part time Poet for your hard work on this project!! It is a reminder of what a privilege it is to be a member of the Zone!! It sure makes one feel all warm and fuzzy inside, doesn't it! Thanks to everyone who helped with this project - such a worthwhile cause and really demonstrates what big hearts Zoners have. Wonderful news! Thanks to everyone! The Zone is amazing! It's wonderful news! Way to go, Zoners! We did it! What a wonderful thing we all did. What a beautiful community eh? Wow, I am a little wordless. Thank you Part Time Poet and Theresa for your leadership. It's amazing what people can do when they join forces. Wow. That's amazing! So proud of everyone!!! Thanks to PTP and Theresa for all of their hard work on this and thanks to the Zoners for posting such a fine total! Also sending my thoughts and prayers for Japan as well. Thank you Part Time Poet and Theresa for giving us a chance to show our love and appreciation to Johnny in a tangible way. It warms my heart, and I hope it warms his, to know how this wonderful man inspires us to be better and better than we were before we knew him. and to Johnny who is our inspiration!!! Such a grand total (grand being the operative word) and amazing considering all the other pleas for money from many others due to disasters that have occurred this year alone. I freely admit that when I saw the goal total of $5,000 I wasn't sure we'd reach it, I kept watching checking the thread and I must have bitten inches off my nails worrying we wouldn't make it, I shouldn't have stressed so much. The Zone always comes through and accomplishes what it sets out to do. Part-time Poet and Theresa for all the hard work involved in planning and posting this appeal, I hope you both feel proud of what you've accomplished. We may all have donated finances but you're the foundation that starts it off. In-too-Depp, I'll admit I had a few nail-biting days in the middle of the project. But the Zone came through, as always...and even better than I hoped!